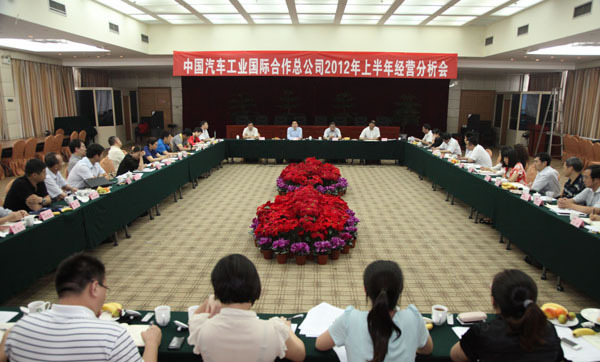 July 19, the first half of the year operating analysis will of company was held, attended by members of the Party and government leading bodies of company and middle-level cadres, presided over by vice president Qiao Gong. The meeting will begin with Joe Engineering vice president’s briefing the completion of the overall operating indicators of the first half of the year. According to the briefing, main business indicators of the first half of the year had reached the target of half the time more than half the task, with the operating income growing of 2.04% year on year, getting to 54.11% of the Group’s assessment; with the gross profit increasing of 255.2%, getting to 54.53% of the Group’s assessment. Heads of operating entities and subsidiaries reported respectively the completion of the operating indicators of their own unit, and the situation of the new market exploring as well as new projects progress, analyzed the operating trend and problems facing the current work with corresponding solutions. Completion of annual operating tasks was predicted. Functional departments summarized and combined their department’s work in the first half year from different angles. During the meeting, leaders in charge of operating segments made overall analysis concerning the operating situation and existing problems, and proposed improvement measures and requirements. President Ji Xuecheng made a concluding speech, after listening to the analysis report of person in charge of operating segments and head of operating entities. He pointed out that in the first half of the year, in despite of a slow start, company operating entities assumed significant responsibility and pressure, acted quickly and tried hard; functional departments implemented and coordinated with no bare effort in accordance with the management objectives. It was not easy to achieve good result with half the time more than half the task under the joint efforts of all the staff. Concerning the work of the second half, president Ji Xuecheng reiterated the seriousness of signing target responsibility paper and put forward specific requirements and expectation. He asked that all departments analyze the situation facing the second half or the next year, that operating entities focus on the following two leading lines, firstly, the achievement of the business objectives of the whole year; secondly, getting down to the work of next year, when new markets opening up and new projects exploring would be very important tasks, while functional departments continue to make efforts focusing on the business center on the basis of the first half. President Ji Xuecheng made a deployment of the focus of the second half of the year, stressing that the end of July was a “diagnosed” stage of enhancement, when departments concerned should take it seriously and prepare the reporting. In accordance with the guiding ideology for grassroots organizations building of “strengthen the sense of responsibility, improve the institutional mechanisms, create good atmosphere”, the management enhancement should be treated practically with all business covered by provisions, and the foundation management of company be lifted to a new level by enhancement. The focus of the second half of the year consisted of strategy formulation and grass-roots organizations building, which were relatively heavy, hoping each member of leadership team set deep foot in business and departments in charge, to complete business objectives of this year and make a good layout for next year leading the team.